Rooms, services Are you looking for a remarkable trip to Czech Republic? Take a look at what Hotel Voyage Prague has to offer! 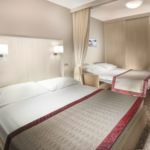 The hotel is offering 33 tasfefully furnished, nice rooms for those looking for a place to stay at in Prague. The hotel provides a parking space for you. Upon preliminary notice airport transfer is provided. You may secure your valuables in the safe. In the rooms of the hotel you may go online without additional costs via wireless Internet connection (WiFi). 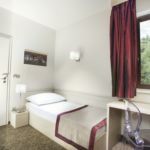 You can find the exact list of services provided by Hotel Voyage Prague (including those for extra fees) and the exact equipment of the rooms on the information sheet below. The rating of Hotel Voyage Prague is 8.8 from the maximum 10, 2 based on actual and valid guest ratings and reviews. "A wifi nem működött a szobában." "Szuper volt a reggeli, tiszták a szobák, kedvesek a recepciósok."